I must admit, I haven’t ever been a massive fan of Valentine’s day and am not usually into the spirit. The whole commercial aspect is a bit off-putting. Whilst I don’t even really expect a gift on Valentine’s day, I always appreciate a thoughtful act. But, I’m not a huge fan of flowers as they are expensive and only last 1-2 weeks. I would much prefer an indoor plant gift, something that lasts and grows. This Melbourne Valentine’s Day 2018, we’re encouraging all Melbourne lovers to consider gifting a plant online rather than sending flowers online. In the past, sending flowers online across Melbourne has been the most convenient go-to option to celebrate special occasions, such as Valentine’s Day. Not anymore! Realising that indoor plants are so popular now, and so they should be, we bring you an online gift delivery service specialising in indoor plants and other botanical gifts – delivered free Melbourne wide. The best thing about gifting a plant online Melbourne is that plant gifts are sustainable, and they are loved by men and women. So they make the perfect Valentine’s Day gift for him or her. And what better opportunity to score one for yourself and your partner than Valentine’s Day 2018 in Melbourne. Why gift a plant this Melbourne Valentine's day rather than sending flowers online Melbourne? Indoor plants not only look beautiful, fresh and green in your home for years to come, they are known to clean the air we breathe by eliminating harmful toxins. Plants take in carbon dioxide and convert it to oxygen, thereby improving indoor air quality. With so many of us leading busy lives and spending a lot of time indoors at either work or home, this has become increasingly important. Studies have found that indoor plants are associated with improvements in emotional states. Studies have also shown that indoor plants are associated with increased creativity and productivity - so they make a great addition to any workplace. Additionally, research has found that plants in an office can prevent fatigue. To celebrate and encourage sustainable gifting this Melbourne Valentine’s Day, and unique online Valentine’s day gifts Melbourne, we have a very special offer for you. We are offering a $10 discount on our large plants. 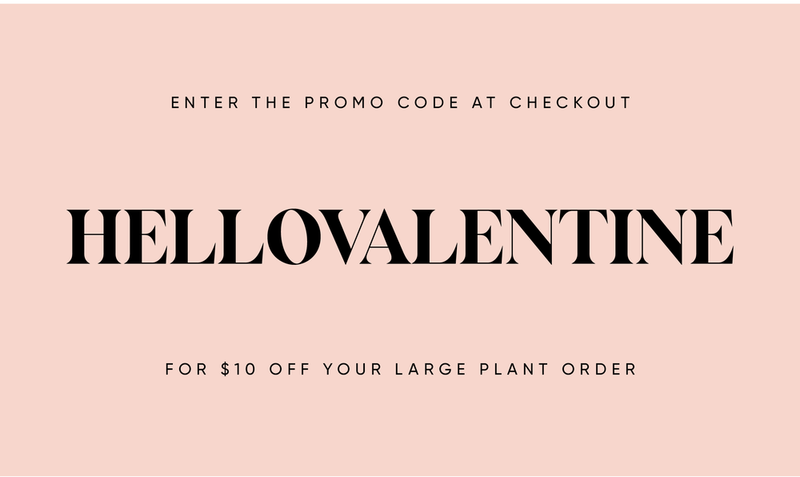 Just enter the promo code: HELLOVALENTINE at check-out. Currently in our shop is the stunning large Umbrella Tree. So, for just $49, you can purchase a beautiful Umbrella Tree and have this delivered to your loved one’s doorstep, anywhere in Melbourne. Our plants are presented in a hessian planter bag, with a handwritten card. Price also includes Melbourne delivery within 2 days. Note: This price of $49 will only apply to orders placed by the 12th February. We take pre-orders, so place your order as soon as you like. Just let us know at check-out that you'd like your plant delivered on Valentine's Day. If you miss this cut-off, and place your order on the 13th or 14th February, you can still use the Valentine's Day promo code. But you will need to pay the $12 shipping rate to guarantee same or next day Melbourne delivery.